Culture change expert Carolyn Taylor told me this story, about a senior executive who didn’t like bad news. When he heard bad news he had a tendency to shoot the messenger. Over time, people started keeping bad news to themselves. They would sugar-coat their messages or conceal information that might upset the boss. When he came to Carolyn for help, can you guess how he described the problem? Here’s what he said: “I don’t feel like I know what’s going on in my organization. People are not keeping me in the loop, and they are hiding information from me.” He didn’t realize — at least, not at first — that his behavior was causing the very problem he wanted to solve. He had a very big blind spot. 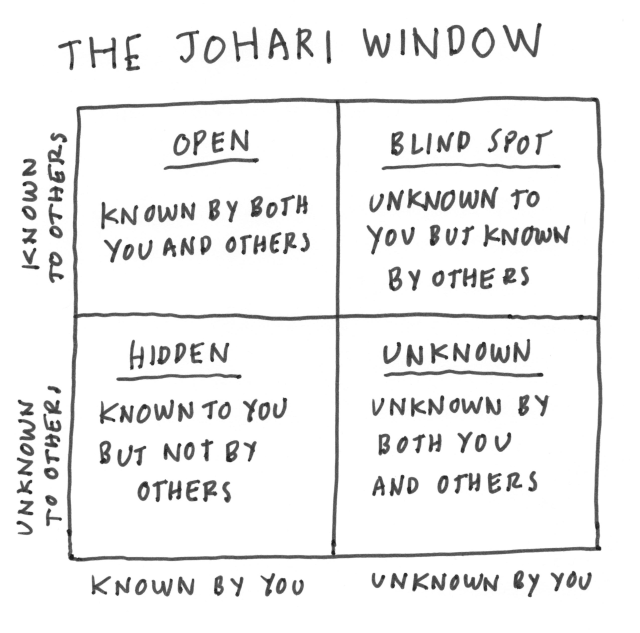 The Johari window is a framework developed by two psychologists named Joe and Harry (Really!) as an aid for understanding the self. It’s a great tool for Liminal Thinking. You can imagine it as a building with four rooms. One room is open. This represents things that both you and others know about you. For example, this might include your job title, your hair color, and so on. You might say this is the “public” you. Another room is hidden. This represents things you know about yourself that others don’t know. This might include feelings that you don’t share, or other things you conceal from others. This is the “private” you. Another room is unknown. This represents the things that you don’t know about yourself, and neither does anyone else. You may have feelings that you are not aware of, or you may be capable of things you don’t know you are capable of. This is the “unknown” you. The last room is your blind spot. This represents the things that others can see about you, but that you are unaware of. Maybe people see you as pushy but don’t tell you. This is the public self that you are unaware of. These blind spots can be crippling to your effectiveness. It’s very easy to see problems and logical inconsistencies in other people. It’s very hard to see them in yourself. This illusion of objectivity is often particularly acute in senior leaders, because there’s a tendency for people to tell them what they want to hear. Many problems that senior leaders most want to solve are, at least partially, and usually unconsciously, caused by their own behavior. So if you have a persistent problem that keeps popping up and seems intractable, start by assuming that you are not objective. Think about it. If you care enough to try to solve a problem, then it matters to you. If it matters to you, it must affect you in some way. If it affects you strongly, that means that you are probably not outside the problem. You are inside of it. You’re a part of it, probably in ways you are not fully aware of. So often, we try to solve problems as if we are outside them. When people describe a problem you will often see them pointing away from themselves. You will hear the word “them” a lot. That’s because “they” are seen as the problem. But in most cases, “they” are only one part of the problem. The problems that most resist solutions are system problems. In a system problem, if you’re part of the system, you’re part of the problem. Your biggest blind spot is yourself. If you are not willing to look at your own contributions and inputs to the situation as part of the problem, you won’t be able to see it clearly. Your understanding will be distorted and so will your beliefs. Assume you are not objective. If you’re part of the system, you’re part of the problem. Download this List of character traits (PDF). Print a few copies of the list and give it to a few close friends that you trust. Now go down the list and check all the traits that you think apply to you. Have your friends do the same (traits that apply to you, not them). You can also share this nifty online form created by Shiri Dori. Then compare the lists. Traits that show up on your list but not any of theirs are Hidden. Traits that show up on yours and theirs both are Open. Those traits that show up on their lists but not yours are Blind Spots. Traits that show up on none of the lists are potential Unknowns. Make a large drawing of Johari Window and fill in the traits. What insights does it give you?